More luxurious cars from the same time period as the Corolla and practically every modern car is already fitted with them from factory: Hood lifters that keep the hood up for you while you work on the engine. Not only does it look so much better than that measly stalk that has to be hook up to the hood, but they are also not in your way when you have to work under there and can't be knocked over resulting in a hood falling on the back of your head. All good things, so I had to have them too. 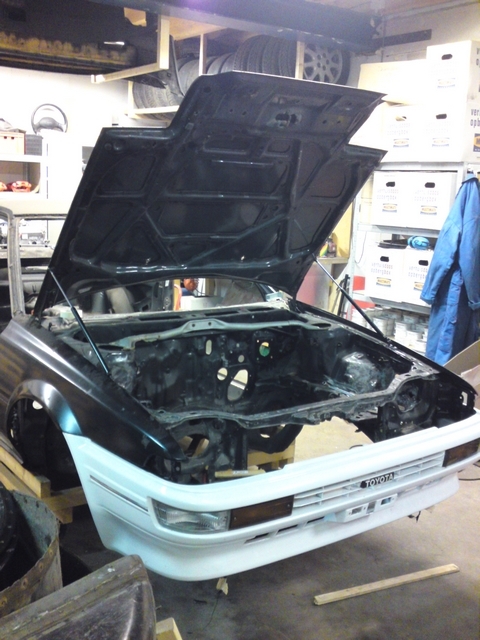 Now, there have been ready kits available for the E9 Corolla. They could just be bolted on and Bob was your uncle. 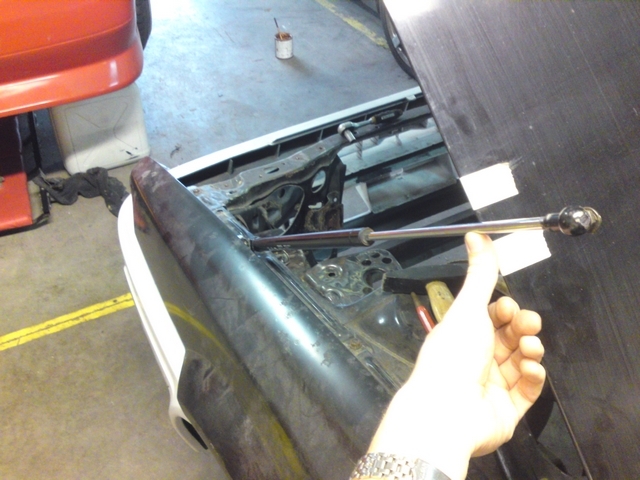 But the quality of those kits left something to be desired and the gas struts were often very short and strong. So strong in fact that they were able to damage the panels of the car. So that wasn't an option. I would have to come up with something of my own. I once took the gas shocks of the tailgate from a Toyota Celica T18 from a scrapyard. Those might do the trick. But when I got them out to try and fit them to the car, it soon became clear that they were not going to work. They were to thick and to long to fit in the space by the fenders and under the hood of the car. On another trip to the local scrapyard, the gas struts on the tailgate of a Toyota Starlet P8 caught my eye. By the look of things, those might have the right dimensions to act as my hood lifts. And the mounting points seemed to be easy to work with. So I took them with me to give them a try. When I laid them in the fender, it looked like they were going to fit. The struts are just strong enough to keep the hood up, so there is no risk of damaging the hood or other parts of the car. The struts would be bolted down with a little plate with a hinge on one end and a M10 bolt with a round head on the other side. But I can't just screw that into 0,8mm thick steel and expect that to last for years. It needs a good strong base in the hood as well to have a durable construction. I'll have to make something for that myself. 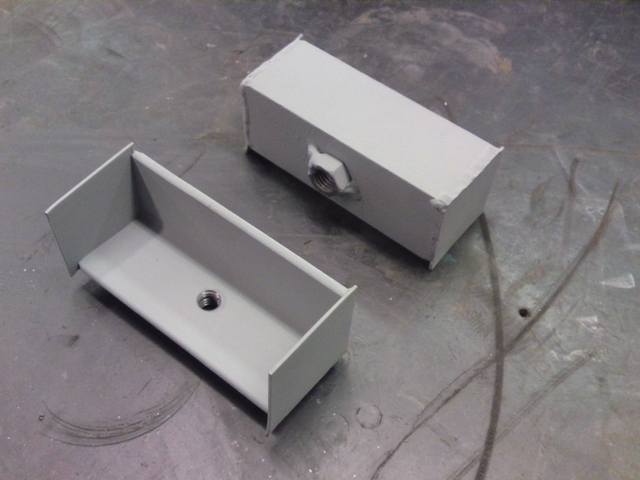 I thought a piece of 2mm thick 90º angle steel with a nut welded to the back of it might do the trick. It would transfer the force of the gas strut over a larger surface area and would provide a solid mounting point for the gas struts to push against. I made the plates a little bigger then needed so I can trim them down a little to make them fit the hood. 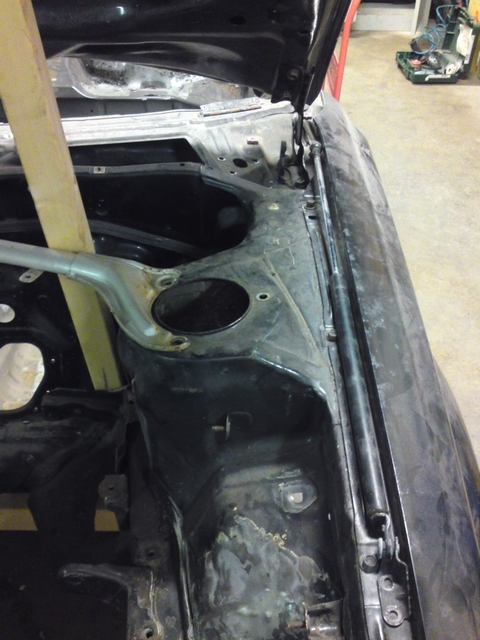 After carefully measuring out where the mounting points should be incorporated into the hood. 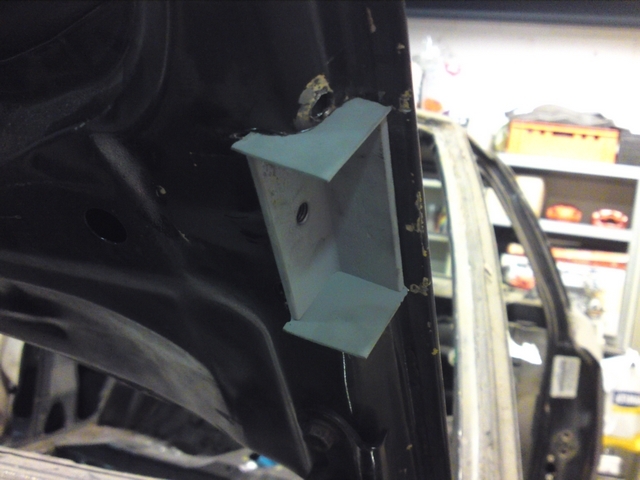 I cut out a piece of the underlying strengthening structure of the hood to fit them in. Now that they fitted into the structure of the hood, I could trim them down and make them follow the contours of that structure. 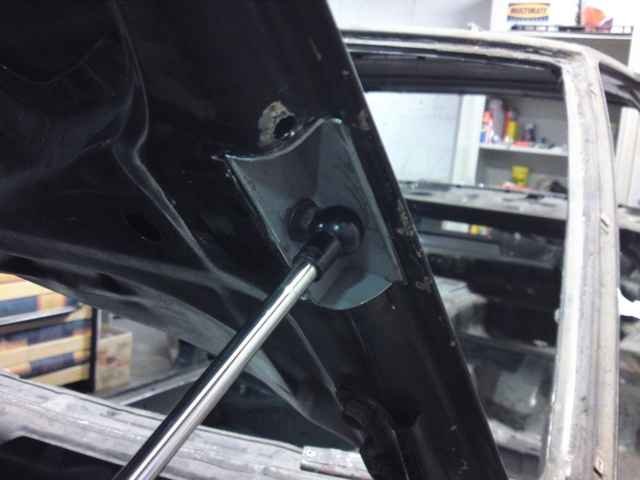 The upper flat portion of the mounting point is lying flush against the hood itself and thus transferring the exerted force in the right spot. And when all is trimmed down, it looks a little like this. It will have to be welded in of course, but that will be done later on. And then I had to repeat this whole process on the other side too. And then I had to see if the gas struts would be strong enough to support the hood under the angle they would push it up to. But that turned out to be no problem at all. They were not so strong that they exerted excess force to the hood and it's hinges, or that it was hard to get the hood back down again. It was easy to shut again without to much force and it didn't pop up when it was opened. Excellent, just how I wanted it to be. The more observant reader might have already seen that I did all of this to the old hood that came with the car. So I will have to do all of this again to the new hood. Because where I did scrap other modifications I made in the past, I still quite like this one and am planning to make this same modification to the new hood.